Brexit campaign leader Nigel Farage spoke to President Donald Trump before the U.S. President criticised her Withdrawal Agreement as “a good deal for the EU”. The call, which was confirmed by the White House rather than by Mr Farage, who respects the confidentiality of his conversations with the American leader, took place “a couple of weeks ago”. “You would not be surprised to hear that we talked about Brexit and the state of play,” the former UKIP supremo told LBC’s Nick Ferrari. “Remember, Trump before the vote came out and said he thought Brexit was the right thing. He is very dubious about the entire European project; he thinks that the nation-states of Europe should run their own affairs and co-operate together,” he added. “I gave my, well, not opinion, but fact that any prospect of a trade deal between the UK and the USA could not even be even a glimmer until at least 2022, which of course is six years after we voted to Leave and would be halfway through his second term,” he explained. Farage told President Trump the agreement was “shaping up to be the worst deal in history” but declined to say what the American had said on the subject of Prime Minister Theresa May’s handling of the negotiations. He did reveal that the Trump administration more generally “find it very difficult to comprehend that what they see as a great country, namely us, are prepared to bow and scrape before EU bureaucrats. The United States is the United Kingdom’s single biggest trade and investment partner, despite having to deal with it on World Trade Organization (WTO) terms as a result of the EU’s failure to secure a U.S. trade pact, and it had been hoped that a British-American deal after Brexit would supercharge growth and job creation on both sides of the Atlantic. Farage intimated that the President saw it as “missed opportunity” that the Prime Minister was signing Britain up to relationship with the EU based on continued subject to its customs and regulatory regime, essentially ruling out a U.S. trade deal. 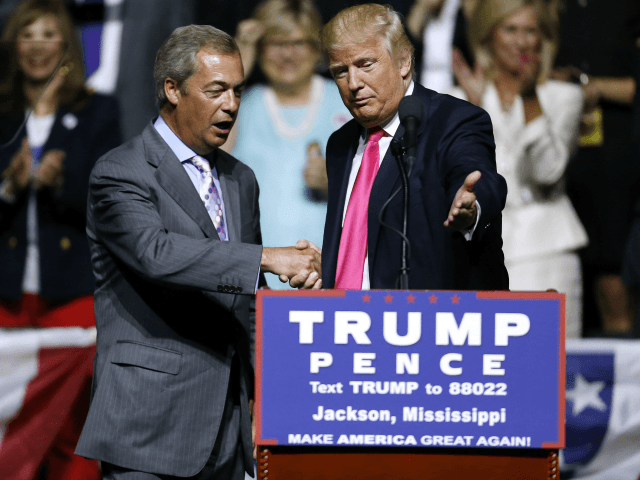 White House sources told BuzzFeed News that “Trump talks regularly to Farage”, who endorsed his campaign for the presidency shortly after the Brexit campaign’s upset victory in the EU referendum.